Time to resume the grand ol' tour of my Vermont apartment! I figured this summer when I was doing some rough editorial calendar planning that doing some apartment tour and home decor-type posts in the dead of winter would be a good use of blog content when it's too cold out to shoot outfits... and I think I was right! I had to cancel an outfit shoot for tomorrow because the weather is just too miserable right now in Vermont. Luckily though it's nice and warm in my little apartment! I'm going to preface the quality of these photos by saying that I shot them myself, and also by letting y'all know that my bathroom is the one part of the apartment that only gets 100% artificial and yellow-toned lighting, so please excuse if the coloring is slightly off in these pictures! (I am a blog photography snob so I have to put that disclosure out there. 😉) Anyways- I also wanted to share apartment tour photos to share that it is possible to have a cute place to live while sticking to a budget. I haven't spent very much money on home decor, but I have gotten creative and have been able to turn my apartment into a place that I love and am happy to come home to every night. Sometimes home tours in the blogging or Pinterest world are a little bit too fancy to be really realistic, so I hope these looks into where I live show you that you don't have to go into debt to decorate! This is what you see right when you walk into my bathroom! 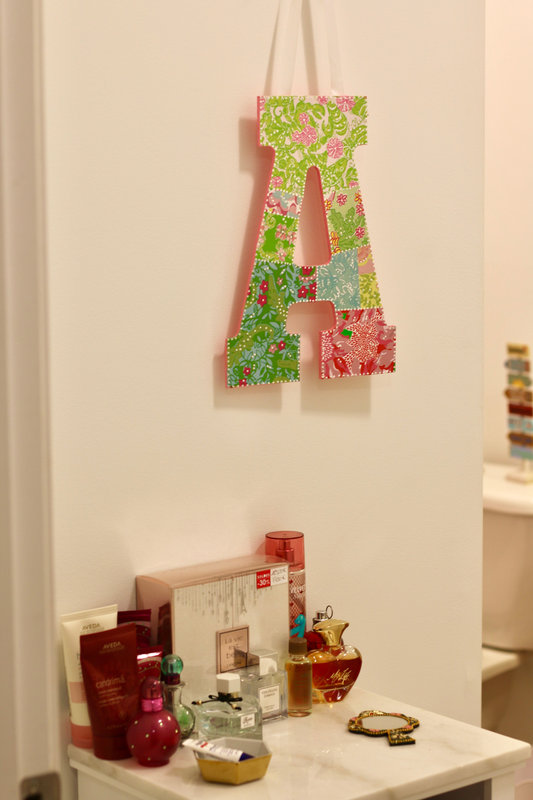 This cute Lilly Pulitzer inspired letter was an old dorm room decoration that I ordered off Etsy a few years ago. I loved it so much that I couldn't part ways with it after college! (I couldn't find the shop that I'd ordered it from, but these letters are available and really similar!) 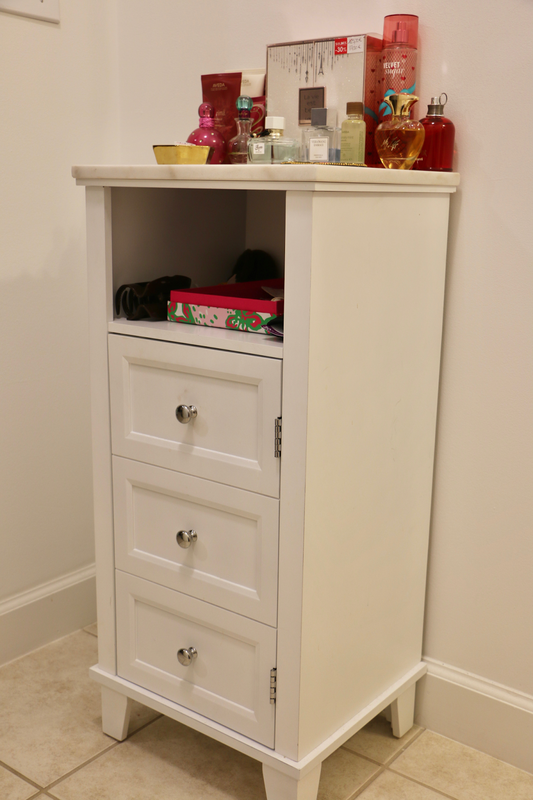 This small bathroom cabinet is actually the very first thing that I purchased for my apartment in Charlotte, back while I was still in college! My friend Cara from Caralina Style and I were at Marshall's one day last year, and I saw this and knew I had to scoop it up. I still love it, and I really love the marble top on it. I keep my perfumes organized on top of the cabinet, and my nail polishes inside in the shelves! For about a year now I've been doing gel nails at salons to try and curb my nail biting habit, but I still paint my toenails myself so I keep a pretty good sized polish collection on hand for that! 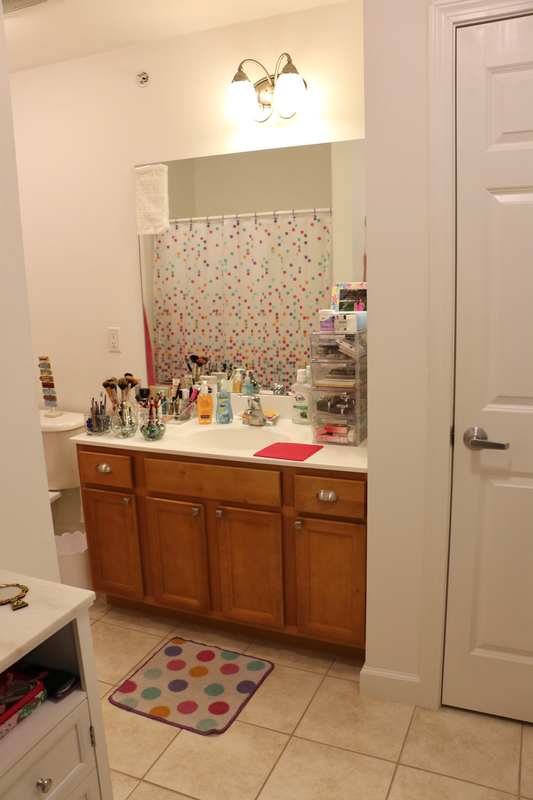 Here's the sink and makeup area of my bathroom! In college, I transformed my dorm room desk into a makeup vanity (since I did homework in the library instead of my room). While I love the idea of having a vanity, it just didn't work out space-wise to do that with the way my current apartment is designed. So I moved all of my makeup into the bathroom, and I like the way it's laid out! These are the acrylic drawers that I keep my makeup stored in, and the brushes and eyeliners are in glass vases from the dollar store. The little pink rubber mat is for my hot hair tools to heat up on so that they don't burn or damage the bathroom counter! You might be able to see a note taped to the top left corner of my mirror. It's a note from my senior year of college suitemate, Caroline, who is one of my dearest friends. Our "thing" when we lived together was leaving each other notes in the bathroom that we shared between our dorm rooms, so when I moved into my own apartment, I kept one of my favorite notes from her in my bathroom! 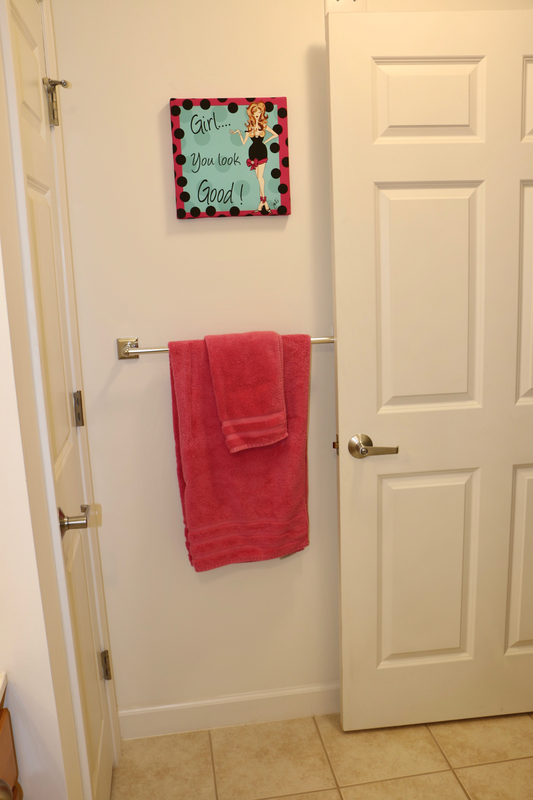 Funny story about how I got my polka dot shower curtain and bath mats! My mom and I went shopping one day at a Kmart in New Hampshire back in when I was in high school, yes- high school! I think it was right after the annual college season, and this set was on clearance. We thought it was so cute, and my mom decided to buy it for my someday apartment. Remember- this was years and years ago! Well, she did indeed save it, and she brought it to Charlotte when I graduated college so it was ready to finally be used! I love the pattern and bright colors. I will probably finally want new bathroom decor whenever I move next, but it's served me well in Charlotte and Vermont. Obviously it's a really old set, but this cute shower curtain is similar! I'm very big on sentimental decor throughout my apartment, and the bathroom is no exception! These were both on display in my Charlotte apartment bathroom, so they made the move to Vermont as well. The little stone was something painted for me in college by Ciera, my former roommate. She was an RA in college and made it at one of her RA programs! 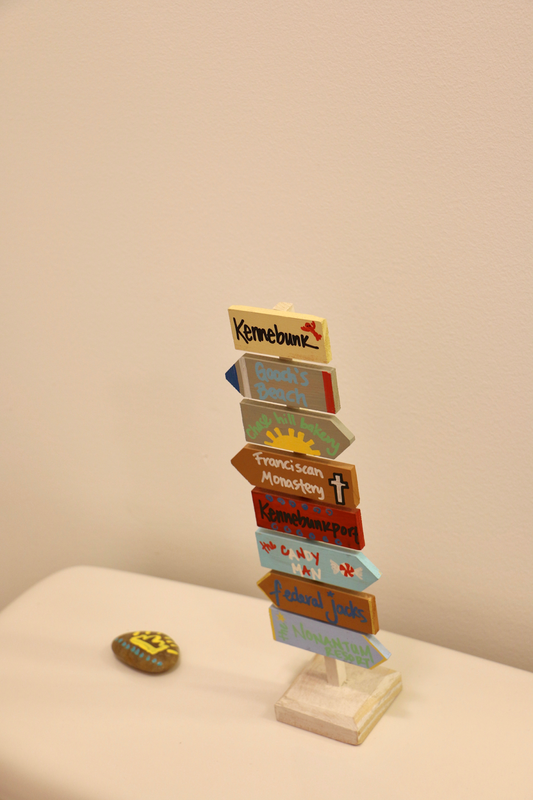 The sign was custom made for my hometown in Maine, and lists all the places on it that were special to me during my high school years. It's a lovely tribute to my home! And this is what you see as you're leaving the bathroom! The "Girl You Look Good" art print is another thing that I've had since college, but I still love it. I have a pretty decently sized bathroom closet, which I'm thankful for. The one downside of my apartment (and most that I looked at in Vermont) is big closets aren't really a thing up here. I barely have any storage areas in this apartment, so I've had to maximize this bathroom closet. I use only about half of it for linens and other bathroom things, and the rest is all just general storage right now! And that's the tour of my bathroom! As I said earlier, I hope to completely re-do my bathroom decor whenever I move next, but for now I'm happy that I kept things totally the same as my Charlotte apartment. I really do love the color scheme too! It's very girly and bright. Thanks so much for reading, and have a great weekend! Stay warm as this cold weather hits! Vermont isn't getting too much of this horrible winter storm that's on the East Coast (only about 3-6 inches of snow), but my home state of Maine is getting hit with blizzard conditions. So colorful! I love that hometown sign, it's so sweet! That eggs in a cake mug is too funny! I feel you on the small closets thing! Our bathroom in our house is so tiny. I was used to having two decently sized bathrooms, but now we have one tiny bathroom! I love how organise your bathroom is! 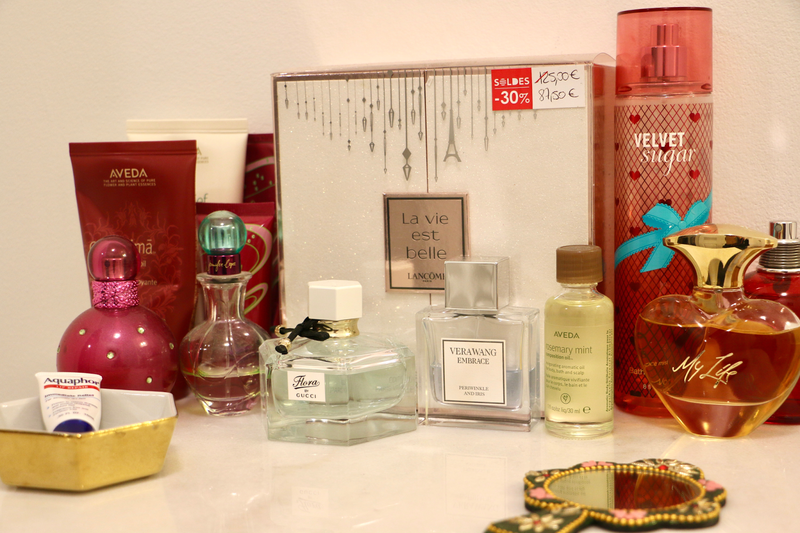 So many pretty shades of nail polish, and gorgeous perfume bottles! I am loving the fun colors in your bathroom! 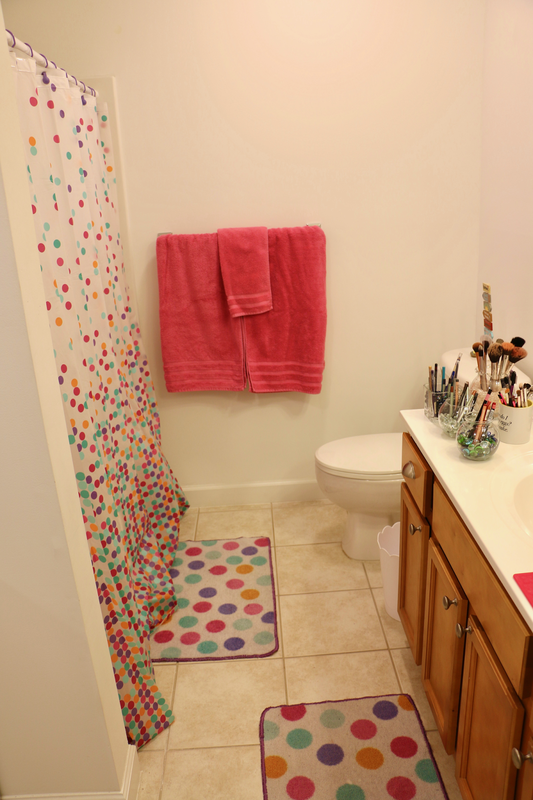 Your bachelorette bathroom is SO cute! 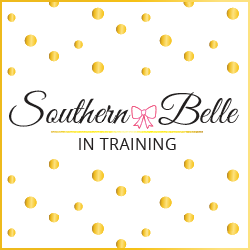 Definitely very girly girl and full of fun and sass! 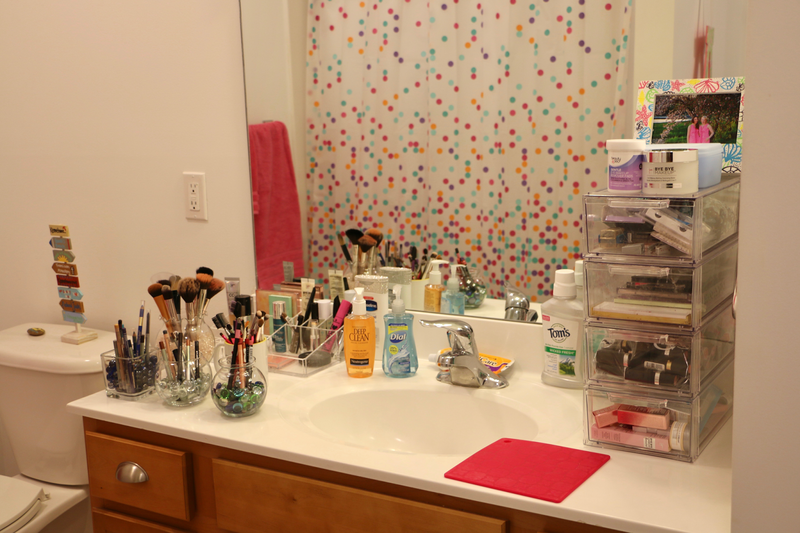 Aww, your bathroom is so organized and colorful! I love your shower curtains! I love the colors of your bathroom and how well you organized all your makeup, makeup brushes, etc. I love that cabinet! I need something similar for all my random odds-and-ends. Ryan wants to get me a vanity because I take up too much room on the bathroom sink with all my makeup! This looks so cute! My favorite were your towels. I love that color! What a fun and colorful space! 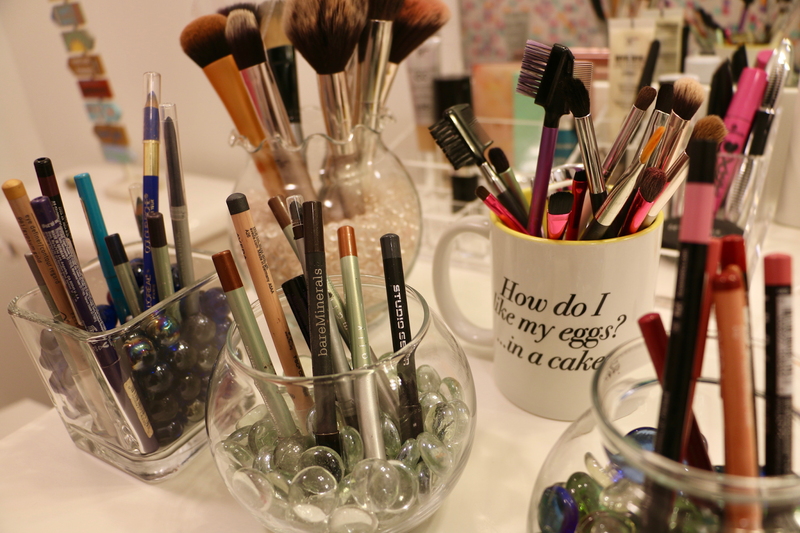 I love how you organized all of your makeup and brushes! Love how you organized everything! So cute and colorful!